The battle against the invasive Burmese python in Florida’s Everglades, reached a major milestone Monday. Early this morning, the 2,000th python was captured by a Martin County man. MARTIN COUNTY, Fla. — The battle against the invasive Burmese python in Florida’s Everglades, reached a major milestone Monday. 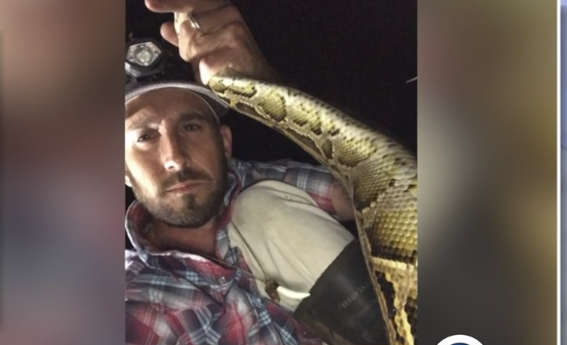 Early Monday morning, the 2,000th python was captured by a Martin County man. Since the South Florida Water Management District Python Elimination program started in March two years ago, hunters have captured the equivalent of about two and a half miles worth of pythons. Mike Kimmel, from Indiantown, had been awake going on 72 hours straight. It’s dark, about 3 a.m. Monday morning in the Everglades. “I was tired, I didn’t see anything until that point but I’m glad I stuck through it because I got number 2,000,” he said. He also owns Martin County Trapping and Wildlife Rescue. With a speck of blood to remind him of the risk, there’s the 7-footer in hand captured in a photo. “The first year they predicted us to get like 60 pythons and here we are at year two with 2,000 pythons. So, we’ve proven ourselves,” Kimmel said about him and fellow hunters. The Everglades delicate ecosystem was ravaged after the invasive Burmese pythons started slithering wild there. Researchers said its population multiplied between 2005 and 2010. In response, the South Florida Water Management District launched this program to pay hunters minimum wage hourly and bonus per snake-more money if it’s longer. A 7-footer pays $125. A 15-footer pays $375. “I have noticed personally in the areas we focus on a decrease in pythons, the pythons we catch are smaller and I’m seeing an increase in wildlife,” Kimmel said. Kimmel notes that there still is a long way to go. SFWMD said they believe the program is having a positive impact. The skin from the hunted snakes isn’t wasted either, often times turned into belts, wallets or boots. This is the 2,000th python captured in the Everglades since @SFWMD started the elimination program in March 2017.